We all strive to have the perfect appearance but often, stress and life, in general, can take its toll. It can leave our skin looking tired and old but in particular, one of those areas that is often affected by this is the Tear Trough. Often, these are referred to as the “bags under the eyes” and they can really leave you feeling low in confidence. However, Tear Trough Dermal fillers can really make a difference. Tear Troughs – why do they develop? Tear troughs are the area between your cheeks the lower part of your eye. The natural ageing process can often cause this area to become hollow and this is where you develop dark circles and saggy skin. As you become older, your skull changes shape and this results in smaller cheekbones. This means that the support you once had around your eyes is weaker and so, when the lower eyelid skin becomes hollow, resulting in the skin becoming thinner. At this point bags in the eyes begin to appear as the fat from your cheeks disappear. However, dermal fillers can help to fight this problem and give you back a more youthful complexion and healthier, younger-looking eyes. What do Tear Trough Dermal Fillers consist of? The dermal filler used contains a natural molecule which is a vital part of the makeup of your skin, nerves and connective tissue. The molecule helps to give you flexibility in your joint while keeping your skin soft. Almost 35% of this molecule is broken down in the body each day and this is caused by an enzyme known as hyaluronidase. Unlike this natural molecule, dermal fillers are made in a way so that they are not broken down in the same way. By injecting hyaluronic acid into the Tear Trough, it helps to lift the skin, hydrate it and leave it looking plump and smooth. As this is a naturally occurring substance, there is a low risk of experiencing a reaction. The procedure is aimed at enhancing the appearance of the Tear Trough beneath the eye. Therefore, it is important that your treatment has been discussed with Rupesh beforehand so that he knows what areas to treat and how much dermal filler is required. The dermal filler ( we use Teoxyl ) is then injected into the area with the results being seen almost instantly. Are there any risks or complications possible during the treatment? Just like any other kind of treatment, there is always a risk but in this case, the risks are low. As a natural substance is used, it means that there is a very low risk of an allergic reaction occurring. Of course, using a highly-recommended specialist like Rupesh will ensure that you get the correct level of care during the treatment. How long does the treatment last for? The results are almost instant but the treatment can last for as long as two years or more in some cases, although this does depend on the individual being treated. Rupesh Shah Aesthetics based in central London’s prestigious Harley Street is known for its safety and high quality. 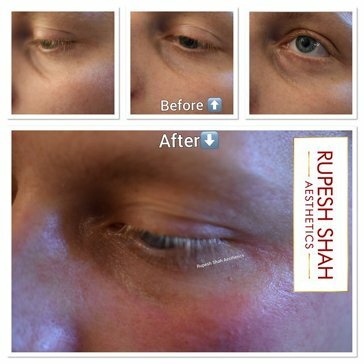 Rupesh ONLY creates subtle and natural-looking results. His results are refined and understated. He will want to make you look the best you can for your age.